I often think that young players need to do more to get love from the home support. Some fans feel that it’s much easier to criticise the younger talent rather than blame the star player that cost the club a fortune when things go wrong. I think that’s sometimes been the case with Scott McTominay at Manchester United. I also think that the midfielder wasn’t helped by the fact that Jose Mourinho often played the Scottish international and complimented him no matter what. United often looked poor under Jose during his last few months at Old Trafford and you could see that Scott’s confidence was low at that time too. But like so many others, McTominay has improved again under new boss Ole Gunnar Solskjaer. The Norwegian decided to sell Marouane Fellaini in January and keep Scott, who was being linked with a loan move at the same time. The young midfielder has had to wait for his chances but he has impressed in recent weeks when he’s been called upon. When Man United were up against it in the Champions League against PSG, McTominay stood out as a defensive stalwart that helped turn the tie around. In that game (according to Whoscored) no player made more successful tackles than McTominay’s five and no United player bettered his 96% passing success rate either. He gave a mature performance in a huge game and that helped get the fans back on his side. The Red Devils youth product followed that up with a decent showing in United’s recent Premier League loss to Wolves, where he’d grab his first goal for the club. Then on Wednesday night, Scott had a standout performance against the mighty FC Barcelona in the Champions League. His high energy approach and harrying of opponents were moments that really caught the eye. Again United may have lost that match but the central midfielder was composed, he was quick at closing down his illustrious opponents and he was good in the air too. Talk is that Man United are going to be losing midfielders Juan Mata and Ander Herrera in the summer. The future of Paul Pogba is also up in the air. United may be in need of more midfield recruits come the next transfer window but at least they have a dependable defensive performer in Scott McTominay who can keep his discipline and win the ball back in the engine room. I’m not saying that the twenty-two year old will be a star player or be an automatic starter at Old Trafford but I do believe that he could become a dependable squad player that can excel in the bigger games much like Darren Fletcher, Phil Neville and John O’Shea did in the past under Sir Alex Ferguson. 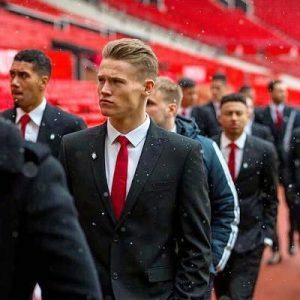 McTominay is a young footballer that will give you his all and that will be enough to matter when it really counts!